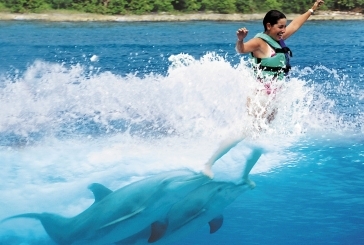 Swim with dolphins in Cancun and enjoy a performance filled with moves and tricks that you´ll remember forever. Kiss, hug, feed and swim with dolphins. Royal Swim, Swim Adventure or Dolphin Encounter, there's an interactive program designed just for you! Create a special bond with the beautiful dolphins while swimming with them in their natural habitat. Swimming with dolphins is one of the best things to do in Cancun and all programs are all-inclusive tours: round trip ferry ride to Isla Mujeres, breakfast, open bar, buffet lunch, beach club facilities, snorkel with sharks and stingrays, bike tour and tour to Isla Mujeres' Downtown. Enjoy one of Cancun's top attractions and have an experience of a lifetime! 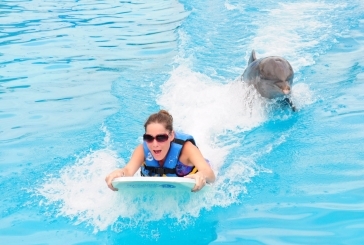 Dolphin Encounter is the swim with dolphin program that lets you enjoy this experience even if you don't know how to swim, if you are pregnant or just prefer to remain in shallow water. This swim with dolphins program is ideal for families with children or elderly people. 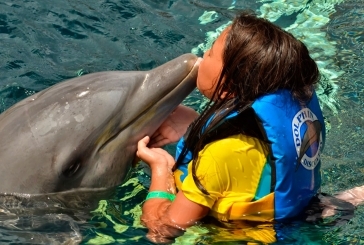 Dolphin Encounter is an all inclusive tour, find all details and deals here, book now! Dolphin Swim Adventure offers you the chance to enjoy dolphin's underwater world, immersing in their habitat using a snorkeling mask. This incredible swim with dolphins experience has a 50 minutes duration in water where you'll enjoy 5 different dolphin behaviors. As all of our swimming with dolphins options, this is an all inclusive service. Get all details and book at the best price now! Dolphin Royal Swim is the most complete and dynamic option available when looking for swim with dolphins tours in Cancun and Riviera Maya. Get personal with dolphins in an 1 hour duration interaction, enjoying more than 7 different behaviors. Ferry transfer, facilities, drinks & meals are included, book now!